A school where students live while they attend classes. Although some boarding schools have reputations for academic excellence and are notable for the elite and privileged social strata their students represent, boarding schools are also often synonymous with sadistic forms of punitive discipline, hazing, and antisocial behavior. In regard to the history of Native Americans, boarding schools have a particularly dark narrative associated with forced assimilation, cruelty, and disappearing students. Of course, not every Native American boarding school experience was dreadful, but in general, the testimony of several generations of boarding school children and their families bear witness to a system of hateful prejudice and dehumanizing policies aimed at producing a servant class of cultural amnesiacs. The first Indian boarding school was opened in 1879 in Carlisle, Pennsylvania, and many more across the country followed. The main goal was to assimilate Native American children into what was understood as dominant U.S. culture: white, Christian, and patriarchal. Many schools went to great lengths to get children to abandon their Native heritage, traditions, and language, enforcing strict punishment if languages other than English were spoken, and even legally changing names to erase familial and cultural linkages. Because of these conditions, Native American communities were reluctant to enroll their children in Indian boarding schools, and the U.S. Army and even tribal police kidnapped potential students in order to meet enrollment quotas. 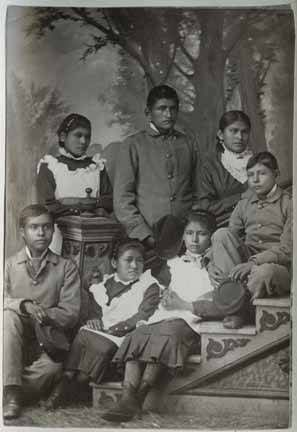 In 1900, the Bureau of Indian Affairs acknowledged the violence, victimization, and even criminalization inherent within the policy of separating families through the forced enrollment of indigenous youth into enrollment in the Indian Boarding School system. As a result, many boarding schools became day schools, but the education of Native American children in traditions, languages, and communities other than their own continues to this day. "Students at Indian Training School, Carlisle, Pennsylvania, circa 1880," photograph by John N. Choate, B.M. Thomas Collection (087572), Palace of the Governors Photo Archive, New Mexico History Museum, Santa Fe. All rights reserved. 1983 Navajo Education. Handbook Of North American Indians. Southwest. Washington, D.
Government Education Programs. Tucson: University of Arizona Press.